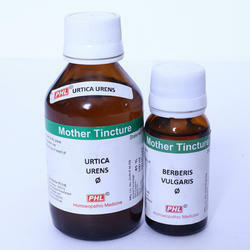 We offer mother tincture that is Mother Tincture and Homoeopathic Medicine. SBL offers more than 400 varieties of mother tinctures of different categories in 30ml, 100ml & 500ml packs. - Broad spectrum activity, used in pre and post surgical skin antisepsis and skin disinfection. 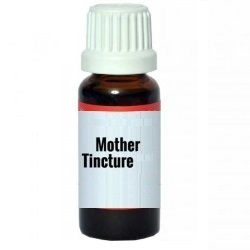 We are engaged in offering highly effective Mother Tincture with wide a range, it is prepare by fresh herbs & use E.N.A with maintaining proper time with skilled personality.After preparation it is tested by ULTRA VISUABLE SPECTRO PHOTOMETER for it's accuracy. Dosage :As Directed by the Physician. 1. At JVS Pharma Co., almost care is taken while selecting the best quality fresh herbs &plants when they are rich In its active constituents. 2. JVS Pharma Co's maceration process of MT's in qualitative to ensure optimum teaching of modicinally active substance of the herbs. - Using state of art technology manufactured under stringent quality control. - Use of finest grade alcohol called grain based ENA which gives maxim, um bioactivity. Backed by years of industry experience, we are engaged in offering a premium quality range of Mother Tinctures. A mother tincture is a solution of a botanical substance and alcohol made according to standards set by the HPI (Homeopathic Pharmacopoeia of India). These are prepared by scientifically proven methods like Maceration and Percolation. Maceration is used for gummy, mucilaginous substances and those having viscid juice.